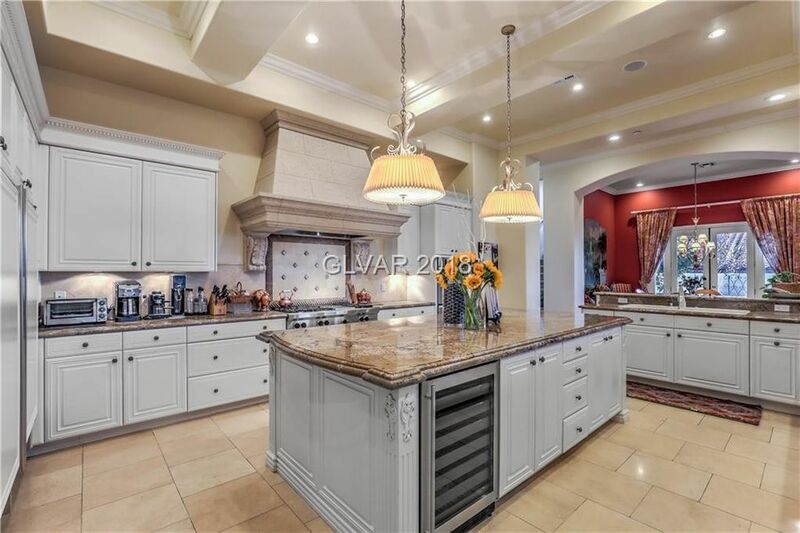 Luxury estate situated behind the double gates of the prestigious guard gated Anthem Country Club. Distinctive home overlooks the seventh tee of the Golf Course and offers exciting golf and mountain views. Amazing attention to detail is apparent throughout, from the dramatic architecture to the state-of-the-art appointments. Curb appeal is enhanced with a generous setback, stamped concrete, travertine, Juliette balconies, and beautiful grounds. Custom iron entry door inspired by travels to Spain opens to a grand reception featuring sight lines to pool and views. Just beyond the entry sits an impressive courtyard promoting indoor-outdoor living. Living room enhanced by coffered ceiling and Realm of Design fireplace. Stately dining room is complemented with hand finished walls and courtyard access ideal for entertaining. Refined kitchen treated to granite, travertine back splash, soft white cabinetry, as well as a mega island. Appliance package includes three Thermador ovens, Wolf 6 burner plus griddle cooktop, Bosch dishwasher, Fisher Paykel dual drawer dishwashers, and Sub-Zero side by side. Kitchen opens to the comfortable family room with media wall, wet bar, and patio access. Master suite consists of sitting area overlooking the golf course and lake, wet bar area topped with marble, and fireplace. Spa inspired bathroom treated to Crema Dorado marble, deluxe steam shower with speaker, Jacuzzi jetted tub, and custom organized closets. There is also a wonderful second master suite tucked treated to a full en-suite bathroom and French door to balcony. Flexible floor plan consists of a sound proof theater room, office space, craft room, massage/gym room, and two full casitas. You will love the convenience of dual laundry rooms, one up and one down. Residence is well appointed using only the finest materials and craftsmanship such as stone, marble, travertine, granite, solid wood doors, fine fixtures, crown molding, and high-tech wiring with Crestron controls. Outdoor living is highlighted by the refreshing scuba depth pool, relaxing spa, peaceful fireplace, built in barbecue, covered patios, stamped concrete, travertine, and beautiful grounds. Spectacular views of the Anthem Country Club Golf Course and mountains. Directions: Anthem Country Club guard gate. South(R) on Anthem Club. East(L) on Grosse Pointe. North(L) on Anthem Pointe through second gate. Park non-sidewalk side only.